MUSIC BUILDS COMMUNITIES (MBC) will comply with the requirements of GDPR. (3) Initial request to attend MBC activities, particularly for family members under 18 years. ii) Emails to distribution lists will be sent using “bcc” to prevent your email address being shared. a) Be removed from the lists etc; but this will affect your ability to learn of current/potential/future activities at MBC. 6) We will retain the information until you request its deletion or for a period of 3 months after MBC is dissolved. Click to see a full version of the MBC Privacy Notice. 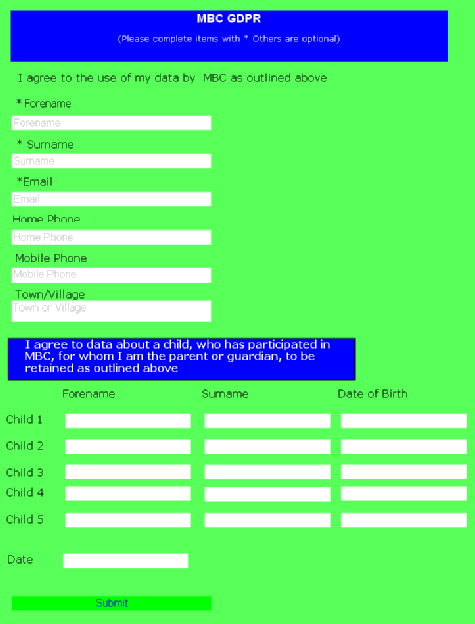 You can indicate you agreement to MBC holding data on you, or your family members under 18 below. Please complete this form for yourself and any children who have participated in MBC activities. After completion you may be asked to put in some words. If you get a V1 message just put in any letter and click submit and then the words should appear. Please then include your forename and surname and that information together with the date of birth for each of your children who have participated in any MBC events. Note: we need date of birth of any children as we will need to obtain their agreement when they attain 18 years of age.